AC invertors follow either a pure sine wave or a square wave pattern which is a distinguishing factor to classify inverters based on their AC output wave forms. While pure sine waves involve electron displacement in opposing directions, accelerating and decelerating after attaining top speed, modified sine waves aren’t even considered as true sine waves. Basic difference between the two inverters is explained below. Modified sine wave inverters are cost effective alternatives designed to provide operational satisfaction at a price affordable by most households. It addresses the efficiency requirements of a photovoltaic system with the in-built capacity to regulate wide variety of electrical load. The only limitation of such a wave form output unit is that it cannot fully operate satellite receivers, battery chargers, computers and other erratic speed devices. Also known as ‘Quasi’ sine waves, the device converts DC electricity to non-sinusoidal AC wave that is quantitatively distorted or modified. Such an alignment basically modifies voltage output from zero volts to a positive. However it cannot reproduce the smooth oscillations of a pure sine wave inverter. Despite not being able to replicate perfect electrical output similar to that of a pure sine wave inverter, this lesser expensive source is ideal for temporary power cuts. The negative by product of modified sine wave system results in noise distribution. Electrical noise or disturbance caused because of a modified sine wave output unit can limit its use to very few electronic and household items. If you operate a TV on such an inverter, it derails video quality and creates ‘snow’ or grain like quality. The casual ‘hum’ on your home entertainment systems is a consequence of modified sine wave inverters. Electronic equipments which require high quality wave form with the least harmonic distortion function efficiently on pure sine wave inverters. Pure sine wave form output units exceed the degree of wattage for a limited period which means the device has a high surge capacity. This technically results in large electric withdrawals to operate sensitive devices like power motors. Virtually any electronic device can function on pure sine wave form that makes it quite similar to utility power outlets. Pure sine wave form outlets are significantly used in commercial sectors and industrial zones since it is a reliable source of electricity that doesn’t cause noise disturbance. The periodic sine wave output produces energy efficient power that secures sensitive loads and powers up appliances like digital clocks, battery chargers, speed motors, home entertainment systems, computers etc. 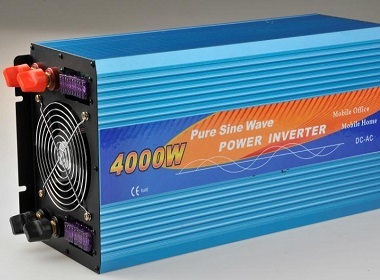 If you’re planning on watching Opera on an expensive television set or are about to utilize a telecommunications application, pure sine wave inverter is an ideal choice for powering calibrated measuring equipments. To increase the total voltage of an inverter (follows ohm’s law) you can connect batteries in a chained series. However if a single battery fails, all other connected batteries will also not be able to power the load. If the additional batteries are connected to enhance capacity and prolong runtime of the system, they can be connected in a parallel configuration. It increases the magnitude of current passing per hour of the battery set. Even if a single battery is discharged, the other connected batteries will follow that can damage the system, perhaps set fire to the system due to sudden battery discharge. In order to counter this problem, the parallel batteries must be connected using diodes or manoeuvred with preset switches to separate the under-voltage battery in unsupervised environments.